To kick off celebrations for our 30th Anniversary Season, we sat down with Bard on the Beach’s founder and Artistic Director, Christopher Gaze. Read on for part one of our candid interview with Christopher about his artistic process over the past three decades of steering Western Canada’s largest Shakespeare festival. Where do you start when you begin planning the year’s season? I’ve learnt to trust my gut a lot. If it doesn’t feel right, don’t do it – and, actually, that goes for just about everything in life. I think that I have fairly universal taste, I know what I like and that’s shown through experience to be a good starting point. Is there a golden ratio between tragedy and comedy that you try to stick to when programming the season? You must always have a comedy to draw people in. There’s no point in thinking that your average audience would rather see Macbeth over A Midsummer Night’s Dream! We always schedule more performances of a Mainstage comedy over a tragedy, so I’d say the rule is 60/40 — 60% comedy and 40% tragedy. What prompts you to explore programming which has not been written by Shakespeare? We established the Bard Lab in 2016, through which artists send us new works that they’re developing or adapting and we invest in them – financially or with rehearsal space, or however we can afford to support them. We generally say that those works should be affiliated with Shakespeare, which is really quite ambiguous. I do think we must never forget that we’re a Shakespeare festival, and that’s primarily what we do, but we have a bit of license to explore other pieces that we think could really be exciting for our audiences. In that vein we’ve staged Elizabeth Rex (Timothy Findlay), Lysistrata (Aristophanes) and more – with great success. And of course this season we’re excited about staging Shakespeare in Love, a stage adaptation of the hit movie. The Taming of the Shrew is back this year, which will be its fifth staging at Bard on the Beach. How do you decide when it’s time to bring back a play? We usually leave about six or seven years in between restaging of a play. With The Taming of the Shrew it’s been seven years since we last saw it. 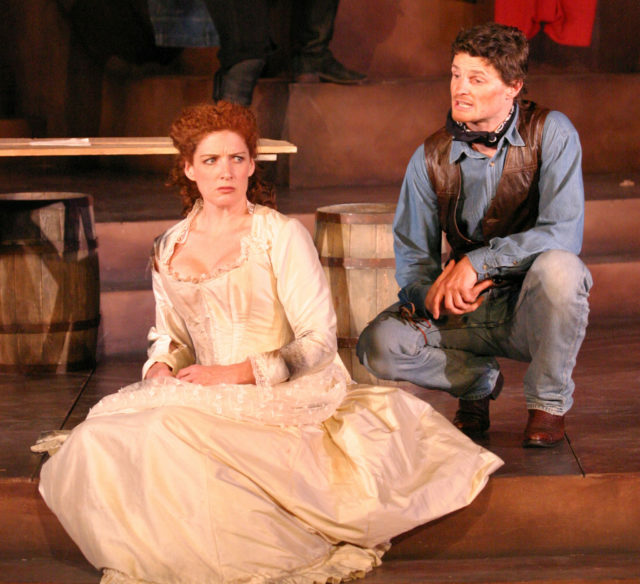 But an earlier production, in 2007, with Colleen Wheeler and Bob Frazer, was such a huge hit. Since it’s our 30th anniversary season, we thought “Let’s just do it again, why not?” And so we’re doing a new production, inspired by that marvelous spaghetti-western staging. Do you have a fail-safe play? Definitely. I love A Midsummer Night’s Dream and we program it when we’re looking for a particular opportunity to intensify the community’s love of Shakespeare. A Midsummer Night’s Dream always generates excitement. I have a hunch it may be coming back again soon. When I began the company in 1990 I said, “We will always do A Midsummer Night’s Dream; every year we will do it.” I’d been involved with two previous companies, both of which only lasted two years, and both did Dream in their first year and had huge success. They didn’t do it in the second year and they both went down. So, I thought, “Well, that’s the answer.” We did it in our first year in 1990, and we did a completely different production of it in 1991. But by that point we had already gathered a large following and I realized we didn’t need to do it again the next year. Our last production was in our 25th anniversary year. I’m always happy when the right time comes around – when I just can’t resist it anymore, and we can have it back! Check back soon for part two of our exclusive interview with Christopher Gaze.